Feed hose entrance from pit and clean mud hose needs to be at the base floor height – unit is going to be mounting permanent on track. Total height of the unit 3.20m – so if volume size is changed please extend the length of the unit from 7.5m to more. GN Solids Control can produce all of the solids control equipment, eg. Shale shaker, desander, desilter, mud cleaner, centrifuge, agitator, etc. GN four phase solids control mud system is working in over 60 countries and areas with good working performance and reliable lifetime. 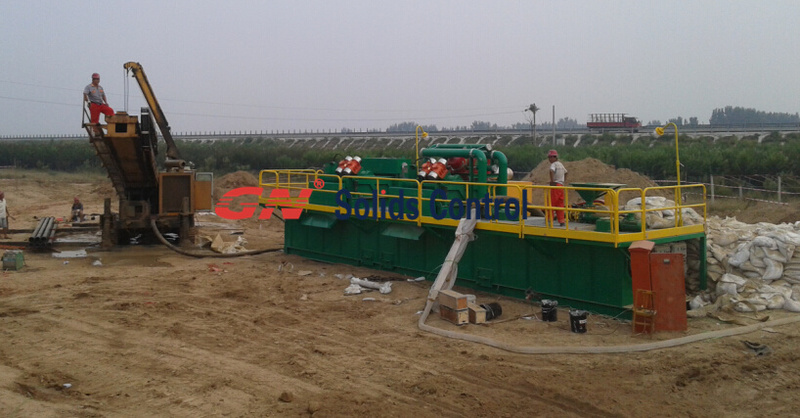 GN Solids Control four stage mud recycling system including below parts. a. 2 deck panel shaker which is professional for diamond drilling, or other simple construction project. b. 3 deck panel shaker which can be used for workover rig and other project. c. 4 deck panel shaker which is most popular for oil drilling circulation mud system and this can also used for drilling waste management. Part 2: Desander working after shale shaker to give further treatment, as the second phase mud cleaning equipment. We also have different type desanders for option. a. desander without deck shaker, cheaper price. Part 3: desilter working after desander to give further treatment, as the third phase mud cleaning equipment. We also have different type desitler for option. b. desilter with deck shaker, reasonable price and better performance. Remark: we can also offer mud cleaner which is combination of desander & desilter. Smaller footprint, but better performance. Part 4: Decanter centrifuge after desilter to give further treatment, as the fourth phase mud cleaning equipment. We have different type centrifuge for options. b. GNLW363 centrifuge which is most popular model for solids control / drilling waste management, GNLW363 is replacement for Derrick DE1000 centrifuge, etc. d. GNLW452 centrifuge is middle speed centrifuge which is professional for barite recovery for oil drilling. Africa is a good region for import & export business. North Africa and west Africa is full with oil & gas resources, countries like Nigeria, Libya, Egypt and Algeria. 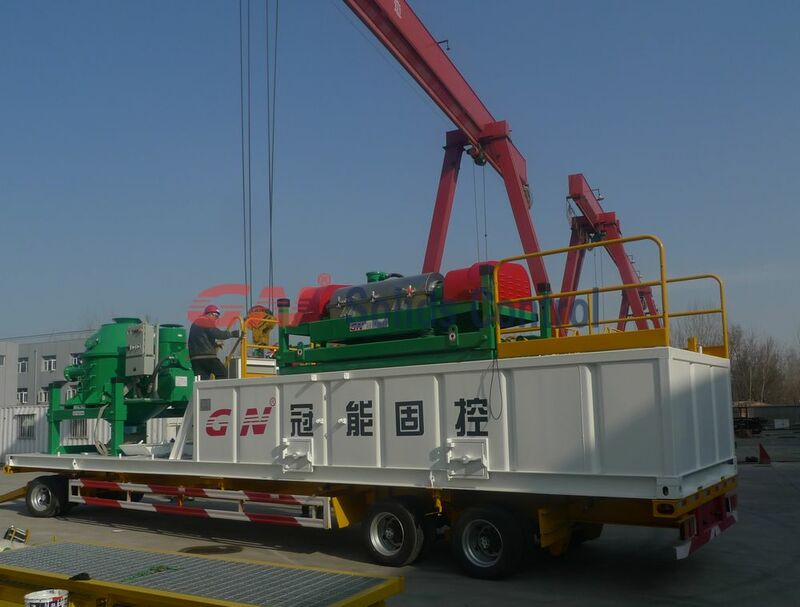 There are many mud service companies and solids control service companies and drilling companies there, which can have lots of business with GN Solids Control. South Africa and Middle Africa is full with golds/ diamond resources, countries like South Africa, Tanzania, Ghana etc. 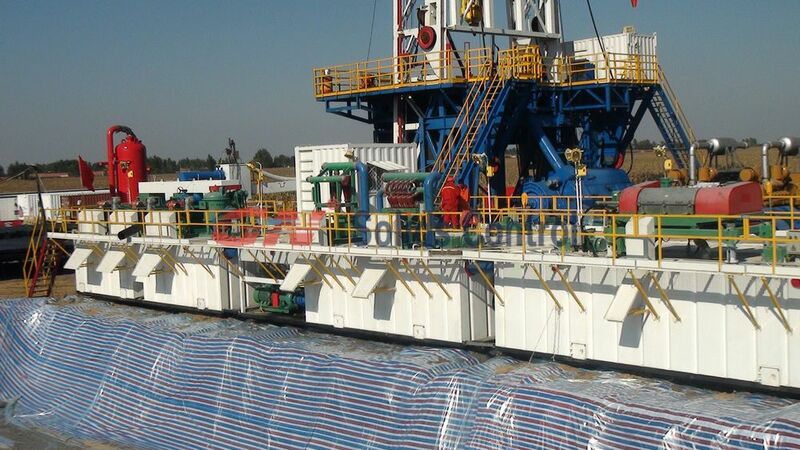 There are many diamond drilling rigs service companies and HDD contractors. 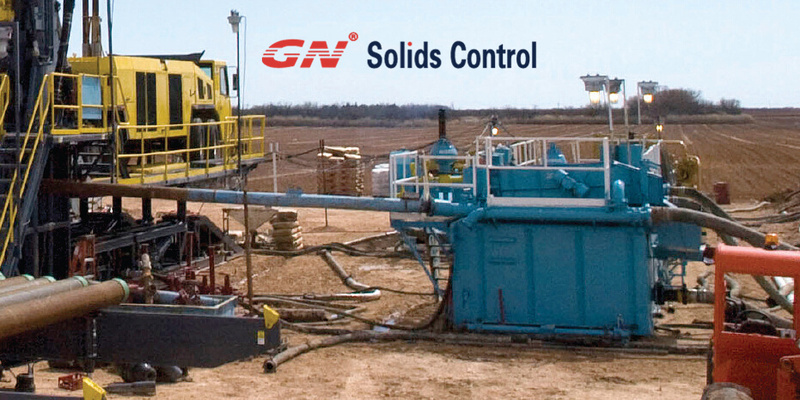 GN Solids Control is a China leading company who focus on solids control equipment. All the separate equipment can combine into oil drilling mud system or compact and economy mud recycling system which is professional for small rigs. 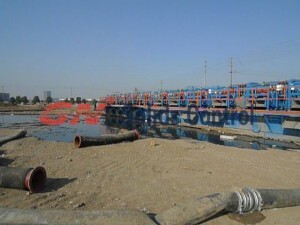 GNMS-500D economic mud recycling system. 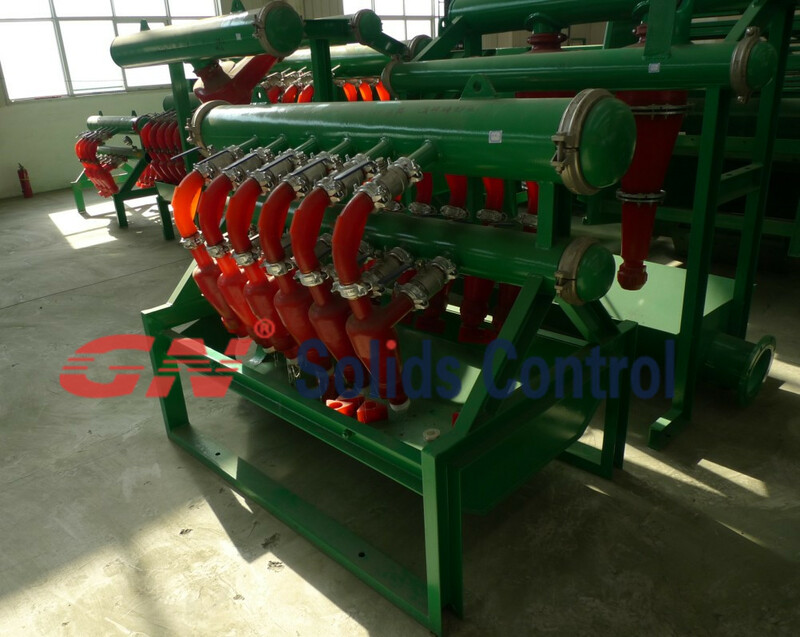 GN Solids Control equipment mainly used on oil drilling, gas drilling, Coal bed methane drilling, Horizontal directional drilling and also geothermal drilling. Recently,we got inquiry from Kenya Geothermal Operation Company. They have one 750hp geothermal rig and want to match mud system for near future project. After have discussion with the operation manager, we offer one compact solution. 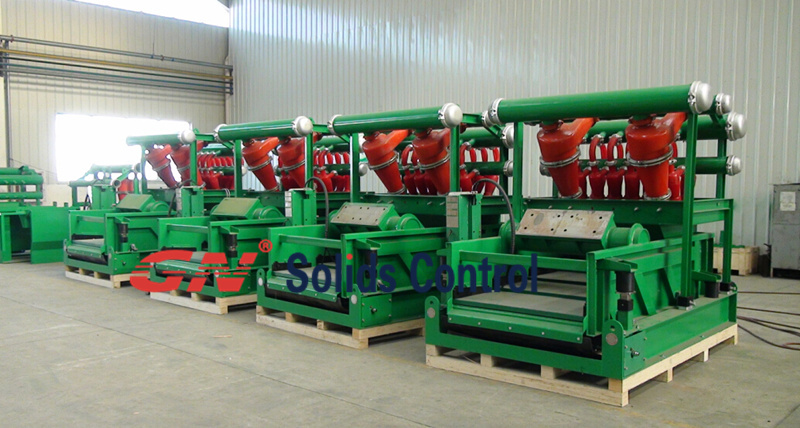 GN Solids is professional manufacturer for complete sets of drilling mud separation and recycling equipment. The conventional equipment like shale shaker, mud cleaner, desander, desilter, vacuum degasser, decanter centrifuge, mud agitator, mud gun, centrifugal pump, screw pump, etc. Here, let’s learn more about desander and desilter. Desander and desilter are solids control equipment with a set of hydrocyclones that separate sand and silt from the drilling mud used on drilling rigs. They can be installed separately: Desander is installed on top of the mud tank following shale shaker and vacuum degasser, but before the desilter. Desilter is installed on top of the mud tank following Desander. They also can be installed completely: in this case, they are installed on one deck shaker and called mud cleaner or mud conditioner. Not only for drilling application( oil & gas drilling, HDD, geothermal, CBM, water well drilling), GN equipments can be also used for mining slurry separation, dredging slurry management, piling and tunneling. GN dredging and dewatering equipments are designed to feed slurry directly from the dredge. GN dredging slurry separation system separates solids from dredging slurry through a three phase system. In addition, the solids that are removed are dewatered to a stackable “press filter” state, which can be readily moved with front end loader, conveyor and/or dump trucks. The effluent is pumped off by a centrifugal pump. The separation process is continuous and operates completely mechanically without any chemical enhancement. The dredging slurry separation system is designed as a three phase separation system, 1st separation is shale shaker, 2nd separation is desander, 3rd separation is desilter. Sometimes as the client’s requirement, we only design 2 phase shale shaker and desander. The desander and desilter are made into separate mud cleaner with large screen area. I ever saw in the water well drilling site in Mongolia that they do not use any solids control equipments but only dig several mud pits, by this way, it is very low efficiency and Environmental Pollution. Solids control system is a way for mechanical removal the drill solids. Mainly it includes screen devices & Centrifugal Separation Devices. Screen devices is the most important equipment called shale shaker. In the future of solids control system, shale shaker will become the only solids control equipment which will be used instead of desander, desilter, mud cleaner, decanter centrifuge by improvement of its design. At present, linear motion shale shaker is the most popular vibration mode shale shaker. But the arrangement of vibration motor various by different shale shaker manufacturer. Sometimes it is vertical installed, sometimes it is horizontal installed, it doesnot mean that horizontal installed shale shaker must be balanced elliptical motion shale shaker, it might be linear motion shaker. As a part of rig package, mud system is a separate but an essential part, the handling of drilling fluids can save huge cost of drilling. In the early oil industry open earthen pits were used as settling area to separate solids and mud thereby acting as a solids control equipment. Now, with the stringent environmental regulations and high mud costs, the economics of an effective mud system come into consideration. Different solids control companies introduce zero-discharge systems, closed-loop systems, “quick move” technology, screening technology, disposal options etc. No reserve-mud pit is used in a truly closed mud system. Mud is continually processed primarily by mechanical means, such as screening, hydrocyclone and centrifuging to remove solids initially. A second stage to remove colloidal solids is by wastewater cleanup techniques. Shale shaker, mud cleaner(or desander, desilter), vacuum degasser, decanter centrifuge , centrifugal pump, mud hopper, mud agitator, mud gun, mud tank and others, such as cutting dryer, screw auger, mud cooling unit,etc. 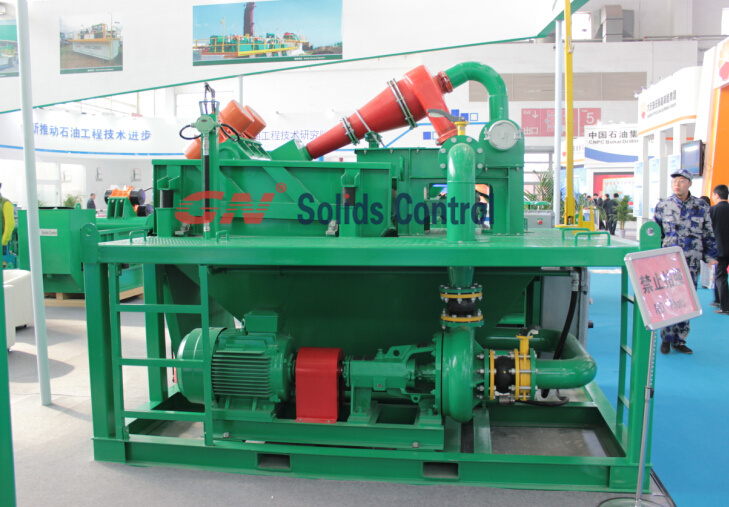 GNZS703 shale shaker produced by GN solids control has been widely used in oil & gas drilling. 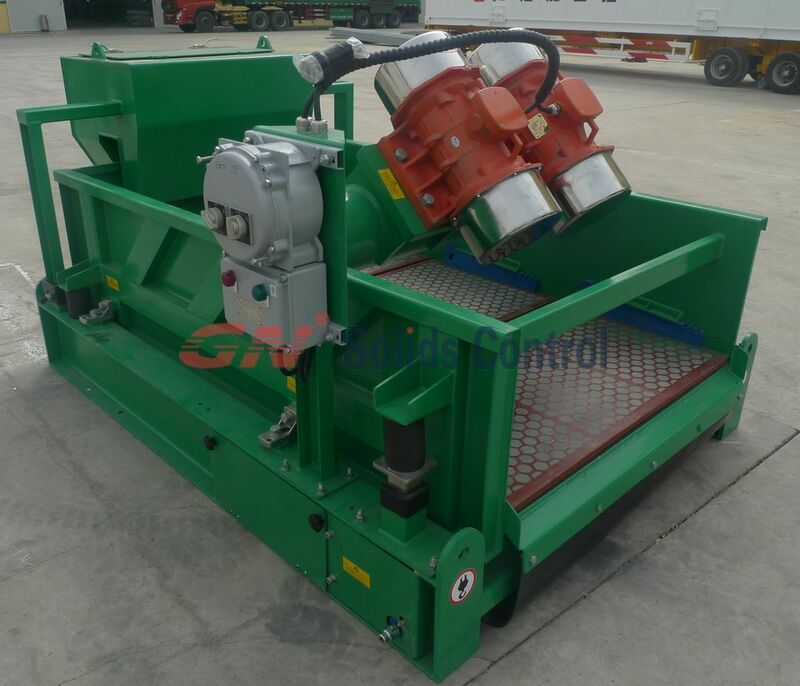 GNZS853 shale shaker is normally used for drilling cuttings treatment. Below is the photo taken in South America oilfield drilling site. 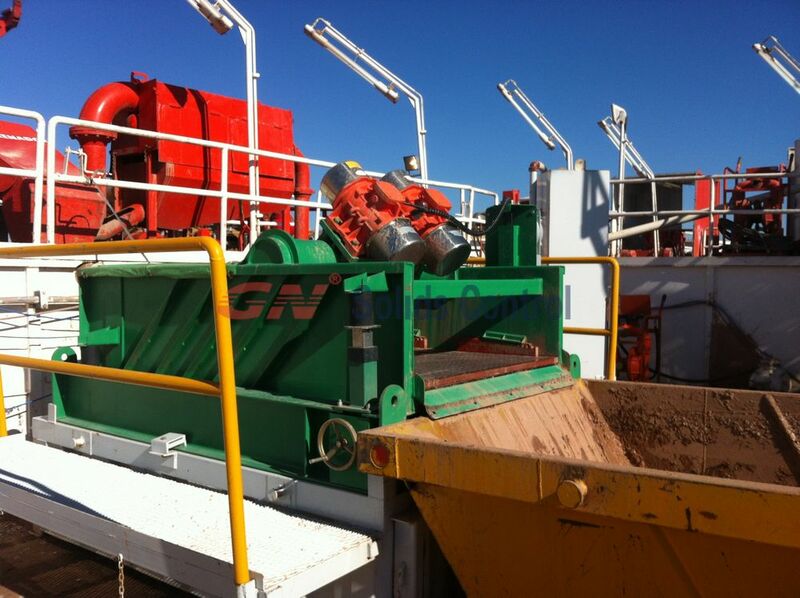 They use GN shale shaker to separate the large solids from the drilling fluids and get clean mud for reuse. Also they user GN shale shaker as a underflow shaker to help the performance of desander cone & desilter cone. 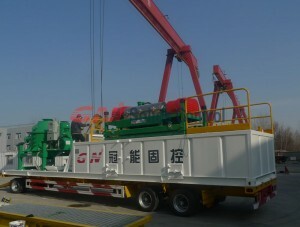 To know how to operate GN shale shaker is much more important, also the maintenance. Only if you operate and maintain it according to the manual, you will use it same with some famous brand shale shakers. A better pool configuration can maximize the screen area and such achieve better result. It is hard to set the deck angle at one time ,it needs the operation personnel adjusting several times according to the flow of the mud .The best pool configuration is when the mud covers the first and second shaker screen. Drill cuttings are separated by shale shaker, decander, desiler, decanter centrifuge, and collected by screw conveyor or vacuum unit , for further separation of vertical cutting dryer & decanter centrifuge. In an ideal situation, all drill solids are removed from a drilling fluid by solids control equipment on a drilling operation. The two primary sources of solids are chemical additives and formation drill cuttings. Drill cuttings are contaminants that degrade the performance of the drilling fluid. If the drill cuttings are not separated, they will be ground into smaller and smaller particles that become more difficult to remove from the drilling fluid. Most formation solids can be removed by mechanical means at the surface. Small particles are more difficult to remove and have a greater effect on drilling fluid properties than large particles. The particle size of drilled solids incorporated into drilling fluid can range from 1 to 250 microns (1 micron equals 1/25, 400 of an inch of 1/1000 of a millimetre).